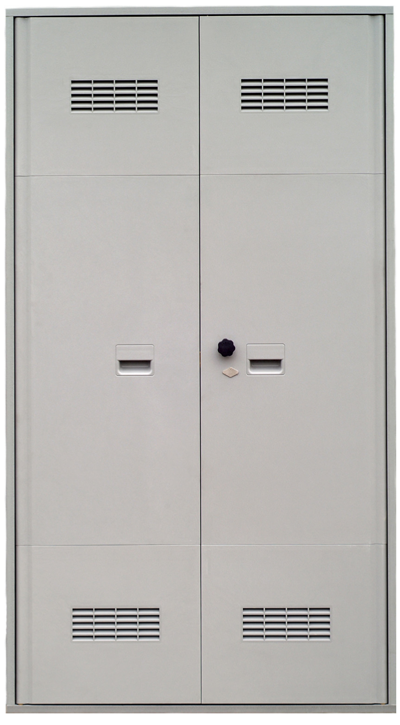 The doors are made of polyester resin reinforced with ﬁbreglass type SMC, ENEL Gray color, selfextinguishing, in compliance with the prescriptions contained in ENEL DS 4974. They have a degree of protection IP 33 in accordance with standard CEI-EN 60529 and IK10 in accordance with standard CEI-EN 50102. They are built according to the technical speciﬁcations ENEL DS1511-DS919. Pre-set for the assembly of locks type ENEL DS988, with three closing points. In case of wall installation, the frame is equipped with six plates for plugs or special clamps.